If you’ve landed on this article, it might be because you adore the little fox-like Shiba Inu and you’re doing your due diligence before purchasing one. Or perhaps you’ve just welcomed one of them into your home, and now you want to be aware of the certain conditions that can afflict this breed, so to ensure your pup lives the healthiest life possible. They’re a breed known for being particularly healthy and have a general life expectancy of 12-15 years. Despite what’s on this list, it’s important to know that the chances of your Shiba Inu experiencing any of these ailments or illnesses are very low. The conditions are listed in order from greatest to least, in terms of commonality when a Shiba Inu is afflicted. If there’s one thing negative to be said about the Shiba Inu’s health, it’s that they have vulnerable eyes. Glaucoma is a disease that slowly destroys the optic nerve in the eye. It’s most commonly associated with a buildup of fluid that creates an obstacle in the front of the eye, which then applies pressure to the nerve. Although the different types of glaucoma range in severity, they’re almost always treatable (to an extent). If untreated, they usually cause partial vision loss or complete blindness. However, different eye drops can be used to reduce the liquid build up, and there are multiple different surgeries that are often successful in correcting the issue. This is another condition which affects the eyes, but it’s a degenerative disease often linked to genetics. It occurs when the photoreceptors in the back of the eye begin to fail, which makes seeing in the dark difficult. As it progresses, the vision loss worsens and the canine begins to struggle even in plain daylight. Unfortunately, PRA leads to complete blindness. While there’s no cure available for the condition, PRA can be diagnosed well before the dog has gone blind. This allows the proper time for both the canine and owner to prepare for blindness. Cataracts usually occur in the later stages of a Shiba Inu’s life, and vary in severity. It happens when there’s an opacity on the lens of the eye, which eventually causes the lens to tear, and gives the pupil that ‘cloudy’ appearance. There are many different types of cataracts, and often surgeries and treatments are available to correct the issue. This condition occurs when the ligament in the knee is weak and dislocates, which often results in a kneecap that shifts in and out of place. 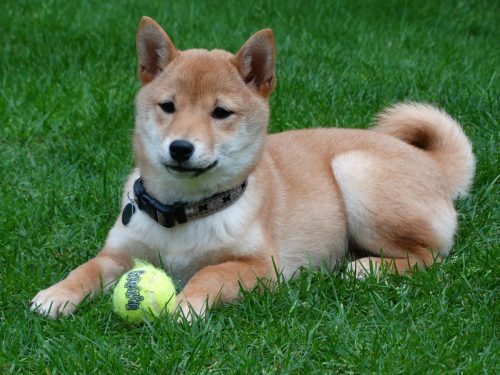 A Shiba Inu can be predisposed to this condition at birth, but it can also develop due to injury. The severity of patellar luxation ranges greatly, from some cases being mild and negligible, and others requiring corrective surgery. The symptoms include an abnormal gait, pain when walking, a hesitance to put weight on a certain leg, lameness in the leg(s), and at worst immobility. Depending on the degree of hindrance, there are tons of different treatments out there available for patellar luxation, as it’s quite common in dogs across all dog breeds. It’s never life-threatening. This condition occurs when the thyroid in the Shiba Inu doesn’t develop properly. If the thyroid isn’t regulating correctly (which directly affects metabolism), then the dog will often become lethargic, obese, and experience hair loss. An excessive need to urinate is also a symptom that occurs in some Shiba Inus. If you suspect there’s something wrong with your Shiba, then it’s important you test him for hypothyroidism, as if untreated the condition can evolve into something a lot more serious. However, once diagnosed, it’s easily treated via medication. Seizures in dogs aren’t exactly similar to what humans are used to. They can take shape as the Shiba Inu running around ceaselessly, hiding in corners in complete confusion, barking at nothing, and freezing up. While seizures are usually not life-threatening for dogs, they can also be indicative of a more serious problem. That’s why it’s incredibly important that if you suspect your Shiba Inu is suffering from seizures, you take him to the vet and have him diagnosed. Often this condition (most commonly known as epilepsy) can be treated by medication, which eliminates or eradicates the seizures, dependent on the severity of the affliction. Allergies, more commonly afflicting Shibas that live in warmer, summer-like climates, can be a nuisance. Typically allergies cause symptoms like runny eyes, swollen eyes, excessive sneezing or mucus, and a clogged nasal passage (which can also link to snoring). If you suspect your dog is experiencing allergies, then be sure to make sure he’s not dealing with fleas and that he is living in sanitary conditions. Allergies can spur from food, certain products (like shampoos or cleaners), airborne pollutions, and more. Your veterinarian should be able to diagnose whether or not it’s allergies your Shiba Inu is experiencing, in which treatment usually becomes a process of elimination afterward. If a female Shiba Inu hasn’t been spayed, then they can experience pyometra during their heat cycle. It occurs when the growth of cells in the uterus is at its highest production rate (this happens during their heat cycle), in which bacteria can migrate into the area and cause a life-threatening infection. While this condition can occur to all female canines, it seems to be a bit more prominent with Shibas, which only furthers the reason they should be spayed. Hip Dysplasia is a big one for all breeds—but it’s most commonly found in heavier set dogs that grow too quickly into their bodies. It occurs when there’s displacement between the thighbone and hip joint. It can cause lameness in the leg(s), difficulty walking, an abnormal gait, varying degrees of pain, and at worse immobility. Due to the nature of the condition and how many breeds it affects, there are tons of treatments readily available. Normally, the dog will correct their gait and live a perfectly healthy life, but in extreme cases corrective surgery is needed to allow further mobility. It’s not life-threatening and varies greatly in severity (often dependent on how it developed). Cancer in dogs is another one that affects all breeds and isn’t particularly rampant with Shiba Inus. It occurs when there’s a growth of malignant cells. Normal symptoms are abnormal swelling, sores (which have a difficult time healing), excessive bleeding from openings, bloating, and difficulty breathing. This condition occurs when there’s an accumulation of fluid in the chest. It can cause a lack of appetite, extreme fatigue, difficulty breathing, coughing and wheezing, and weakness. This condition—similar to seizures—can also be indicative of something else occurring within a canine. It’s usually treated by removing the fluid and incorporating a low-fat diet, but in the more severe cases, surgery is required to correct the issue. Clearly there’s a long list of conditions that could affect your Shiba Inu, but this doesn’t mean they will. To drive the point home, there’s a much larger chance that your Shiba Inu grows to be healthy and old than experiences any of the aforementioned conditions. But now that you’re armed with the knowledge, you know what to look for (if your Shiba is to fall ill) and to seek a veterinarian’s opinion immediately if you notice anything abnormal. But now the question is turned towards how you ensure—on your own behalf—that your dog lives a healthy life. A few of these suggestions are simply common sense, but it’s astounding how few owners actually put them into practice. With most of these conditions, it’s imperative that you catch them early in so that they can be properly treated. That means diligence on your part as an owner. Often, when a new pup is purchased, after their first rounds of shots have been given and they’re cleared to be part of the family, the follow-up visits wane over time. Owners usually only bring their dogs to the vet if they suspect something’s wrong, which can result in a condition that is too far developed. If you want to ensure your dog lives the healthiest life possible, take him for routine checkups at the veterinarian, even if he seems perfectly healthy. This allows you to track the progress of your dog and identify his aging patterns. Just as well, if there’s something malignant brewing, the veterinarian will be able to diagnose it before the problem worsens. It’s an absolute necessity that you develop a relationship with a veterinarian and take your pup for an annual evaluation. This isn’t something that’s recommended for every breed, but since Shiba Inu’s have particularly vulnerable eyes, it’s important that you take them to an ophthalmologist to ensure there’s no pre-existing condition present, and that their eyes are developing properly. If you feel that your Shiba Inu has impaired vision, then it’s vital you take him in, as many eye related conditions need to be corrected in their earliest stages or they can cause complete vision loss in the future. A Shiba Inu certainly requires grooming, particularly because their coats love to shed year round, and with a real vehemence in the summer. Hygiene upkeep is another important part of grooming. It’s important that you brush your dog’s teeth 2-3 times a day to avoid any tartar or bacteria build-ups. Trim his nails monthly if the Shiba doesn’t wear them down naturally. But it’s just as important to examine him weekly for anything abnormal. That means you should probe his ears, eyes, mouth, nose, and coat for anything suspicious. Look for inflammation, redness, infection (often given away by odor), parasites, rashes, and bruising. Your Shiba might be a bit resistant to these checkups, so it’s important you begin the grooming process early as that’ll pave the way for better behavior during the routine in adulthood. While Shiba Inu’s aren’t necessarily glutinous about their food, nor prone to obesity or laziness, it’s still important that you ensure your canine is receiving a balanced diet and the proper amount of exercise. Buy high-quality food and block out time in the day to take your Shiba on a run, then monitor him closely to ensure he’s not losing or gaining extreme amounts of weight. Your Shiba should naturally want to release the ‘run’ in his legs, but when he’s older you might have to play the role of motivator. The Shiba Inu is resilient. They’re resilient towards illness, and resilient in changing their ways (which makes their character so unique). This confident, autumn-colored, quirky, and intelligent animal has a propensity for being independent, and also one for being healthy. As long as you take the proper steps in ensuring your pup is going to live a healthy life, the chances that any of the conditions mentioned affect them are very low. Prepare, educate, and stay diligent. Be a responsible owner and keep that beautiful and loyal canine around for as long as possible.